Another Juno awards just goes to show how awesome Canada is! Vocab had so much fun attending the awards show on Sunday March 15th with our client and Juno winner, Manic Drive. Just like previous winners in the same category, (Contemporary Christian/Gospel Album of the Year), they are so grateful to be Canadian and overwhelmed with the amount of love and support they received from the Junos and from their fans. Congrats guys! 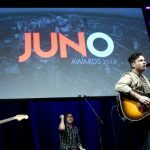 The night was filled with memorable performances including the energetic opening from Hedley, the 80′s groove from Breakthrough Artist winner, Keisza, and the small town band mates turned rock stars – The Arkells (who also took home a Juno for Best Rock Album of the Year). The musical build up throughout the night was intense – good vibes were definitely spread across First Ontario Centre in Hamilton, and everyone was excited to find out who would be named Artist of the Year. “Um, I’d like to thank the Junos of course,” he said, checking the mic to make sure it was on. “I want to thank Canada man, thank you guys. I wouldn’t be here without you. Thank you."